Wireless internet lets you watch or browse from anywhere…as long as your Wi-Fi network works well. Because Wi-Fi depends on radio waves from your wireless modem, anything that blocks or interferes with those waves could mean trouble for your connection. For even more precision, there are smartphone apps available for Android and signal analytic tools for laptops that will give you an actual signal strength reading. Not every home has an ideal spot to centrally locate a wireless modem and some may require a larger Wi-Fi coverage area than what a single wireless modem can provide. 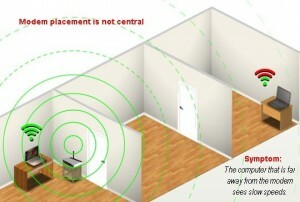 In this situation, a network extender or signal repeater might help. In the same way an extension cord can help get power to an area where you don’t have it now, a network extender or signal repeater may help increase wireless signal coverage in parts of your home where you have poor or no wireless signal now. There are many options available so make sure you research which option is best for your needs. You could also be using the same channel as your neighbor. Most devices allow for the channel to be changed in the setting. Please refer to the manufacturers user guide for more information since how you do this can vary by device. Your Wi-Fi network speed will only be as fast as your slowest device. Those that use older Wi-Fi technologies will cause your wireless network to slow down to a lower speed so they can connect. If you have any devices that use the older wireless standards (as of September 2015, these would include Wireless- A, B, or G) on your network you will likely notice range and performance issues while using them, plus they will keep your newer devices from running at full speed. If you ever wanted an excuse for a device upgrade, maybe now you have one. While computers make our lives more convenient, the magic of computers is balanced by the frustration we feel when they don’t work. To help, BendBroadband offers Remote PC Support. With Remote PC Support, you receive comprehensive support service from our technical experts when you need it and in the comfort of your own home. For $12.95 per month, our technicians will access your computer via the Internet and resolve problems in front of your eyes. Sign up for Remote PC by calling 541-668-6216 or visiting https://bendbroadband.com/remotepc/. Room images created by TDS with graphic support from Autodesk Homestyler at Homestyler.com.